Blank Page Muse: Composimold Embellishments with Sin City Stamps Cont. Composimold Embellishments with Sin City Stamps Cont. Hello! 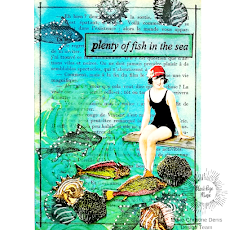 Peggy here to show you how I made this one of a kind card and my favorite stamps. stamp can be found here: Steampunk'd. I created a mold out of my balloon stamp from the Steampunk'd line from Sin City Stamps. I pressed my polymer clay into the mold and created a balloon embellishment that I painted with black acrylic paint and let dry. I made a second pass with some gold acrylic paint with my fingers along the top just to catch all the details. I used some black gloss paint for the center hands of my clock. I created a background with my corrugated card and used molding paste and stencils for texture. I colored my background with perfect pearls. I then created a sentiment with perfect pearls to color. Easy as that! I love than I can create embellishments with my stamps, it opens up a whole new world! I hope you enjoyed my card and don't forget to get your own stamps, chipboard and much more from Sin City Stamps!